What did any human do to deserve this? Last summer, my parents took a trip to the homeland: Germany. I was not asked to attend and my only consolation prize was a slideshow of their photos after they returned. When I say “slideshow,” I of course mean that my dad hooked his phone up to the TV and showed every single picture he’d taken. Source: My dad, the tourist. There were over 1,000. One thousand photos. Most of which were taken by accident from the inside of Dad’s pocket. At some point I nodded off and was jolted awake just in time to see the startling image at left. My dad casually mentioned this was the death mask of Martin Luther. Death mask?! What did any human do to deserve this?! I made it my sad little life’s mission to learn more. Real quick: Based on the name, you’ve probably guessed that Death Mask is the villain in my upcoming critically-acclaimed graphic novel. 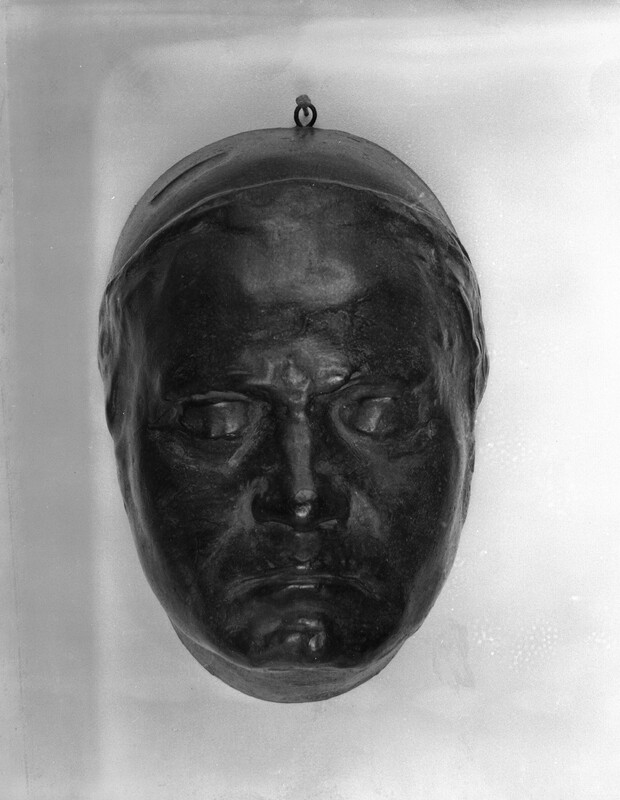 Death Mask sprays a film that covers his victims’ faces until they eventually suffocate and die. He’s never seen without his mask because #spoiler: If he takes it off, he’ll die. Too obvious? OK! Wait, where was I? Ah, yes: death masks! 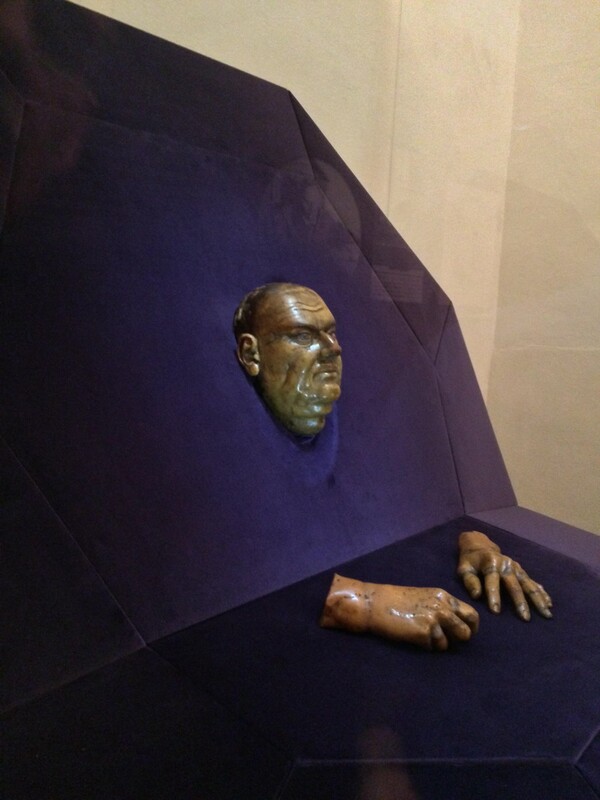 Aside from being the villain in my aforementioned book, death masks are also wax or plaster casts of dead people’s faces, and sometimes their hands, intended to preserve their image. Let’s recap real quick. As early as 1300 BC and continuing through the last century, people’d put plaster or wax over dead body parts and keep the molds as souvenirs. 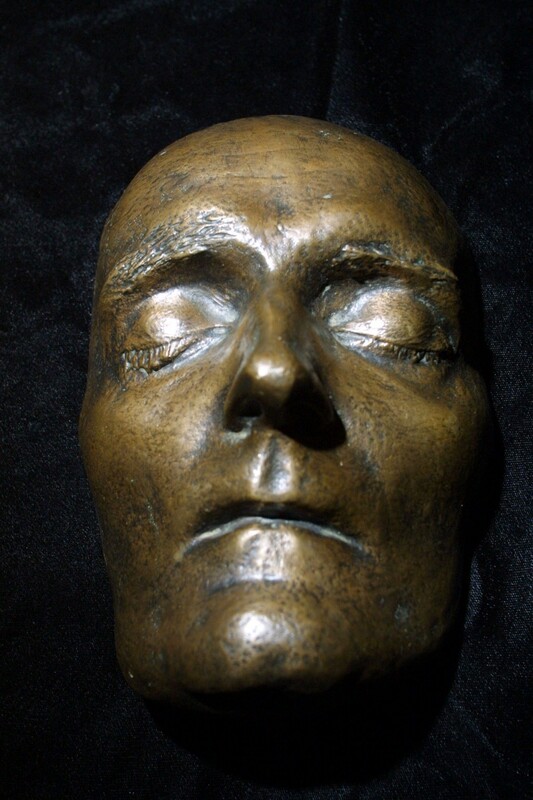 Centuries before the invention of photography, death masks preserved the dead person’s likeness. It’s one thing to have a painting of your dear old grandma — but a three-dimensional rendering of her face that’s true to scale? That’s an heirloom you won’t be donating to the thrift shop. And that’s how everyone wants to be remembered, right? By their bottle-cap-size warts and jaunty jowls. So where in the world did this tradition start? 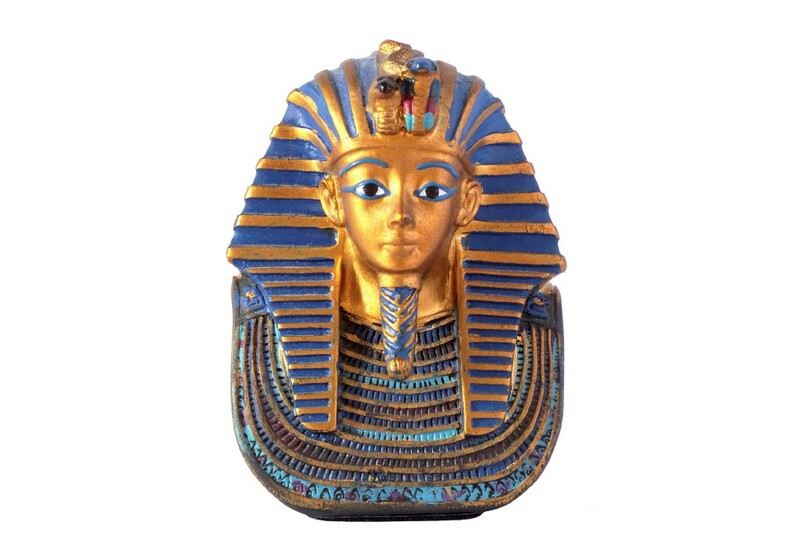 The first death masks can be found in Egypt, where they were made of wood instead of plaster. An Egyptian death mask only looked like the dead person’s face and was not an actual mold of it. Artists at least had the common courtesy to paint the masks, give them a little pizzazz. 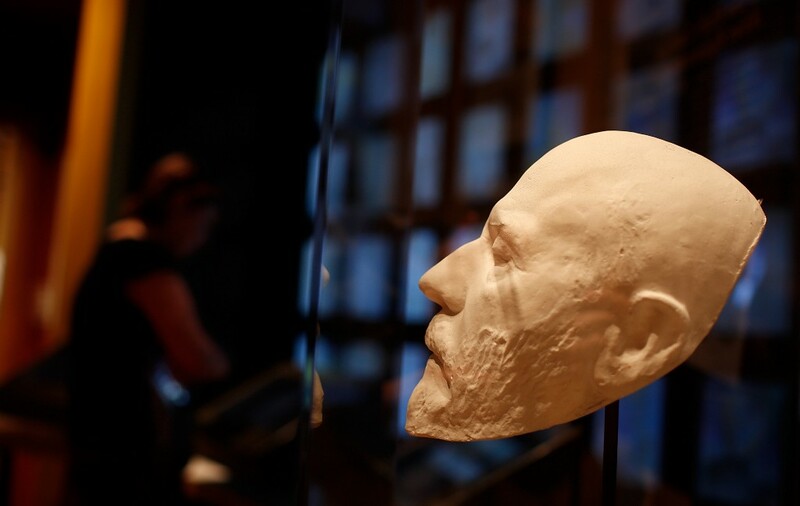 Over in Rome, Julius Caesar’s death mask was famously macabre—more than a mask, it was a full-body molding showing all 23 of the stab wounds that killed him. Mark Antony showed the likeness to a crowd to prove Caesar’s brutal death. The sight of it started a riot that ended in a senate building being burned to the ground. To be fair, I probably would have done the same. 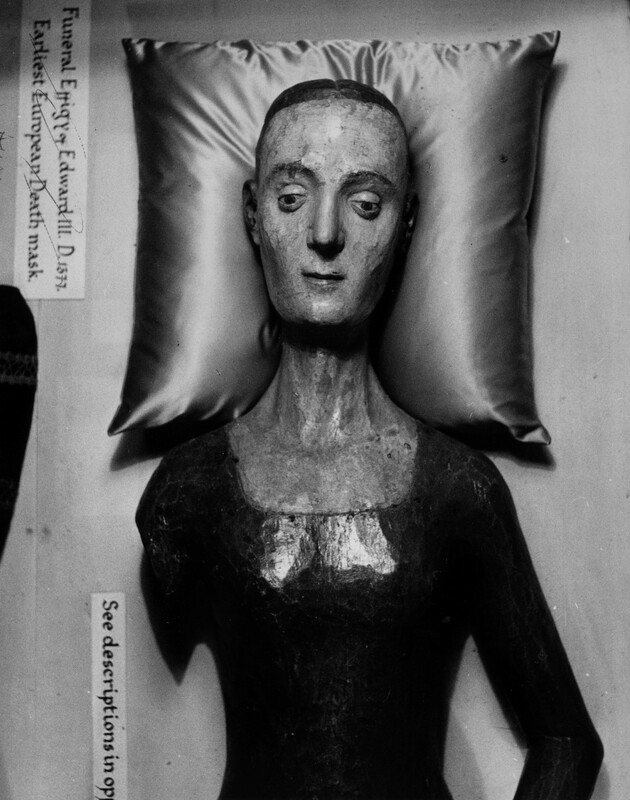 We can thank the Europeans for taking death masks to new heights/deep, terrifying depths. They insisted on making the masks less ornate and more creepily accurate. Artists used the masks for reference when they created paintings or sculptures of the dearly departed. 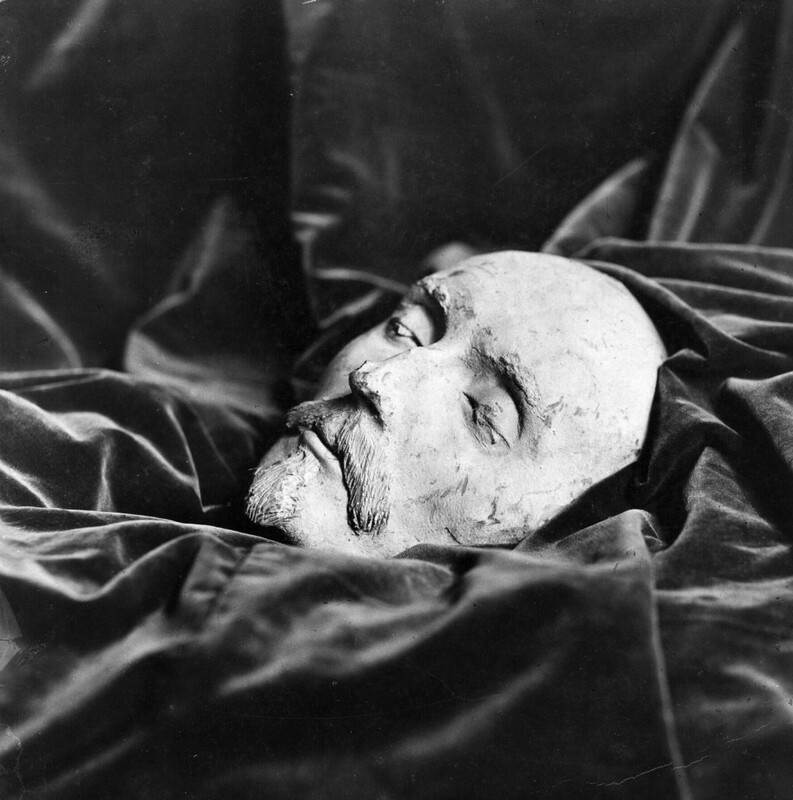 The first known European death mask was King Edward III’s in 1327. You might think that once photography and oil painting rolled around, death masks would become passé. But no! The tradition hung on. Even James Joyce has one! So how were these things made? Ideally, artists arrived within an hour of a person’s death. Thanks to those guys, we have the most accurate idea of what several historical legends look like, since commissioned portraits often glossed over any flaws. The first, and probably worst, part of the process was getting the body into an upright sitting position. This ensured a realistic depiction of the deceased. Then the body’s eyebrows and any facial hair was covered in grease or clay. This way, none of the hair would be ripped off when the mask was removed. Then came the plaster bandages mixed with water, placed over the face to capture even the smallest of details. The bandages could take up to an hour to dry. The original mold could be used to replicate the dead face art over and over. Artists could fill the mold with wax or metal, which dried and BAM! A death mask was born! 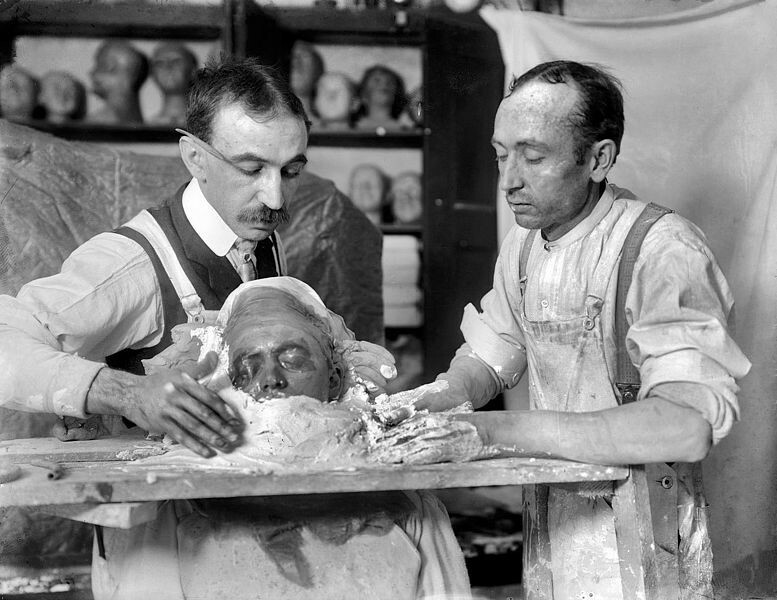 You probably won’t be surprised to learn that one of history’s most famous death mask artists was Madame Tussaud. She got her start making masks of people who died during the French Revolution. Later, however, she moved (not by choice) into the business of making masks for executed aristocrats. Meaning that usually her subjects had been beheaded. Madame Tussaud even made a death mask for Marie Antoinette. Which is a fun fact you can mention to cheer everyone up next time you go to a Madame Tussauds wax museum! What’s that? You hoped there’d be more pictures? Sweet dreams from Catherine de Valois! 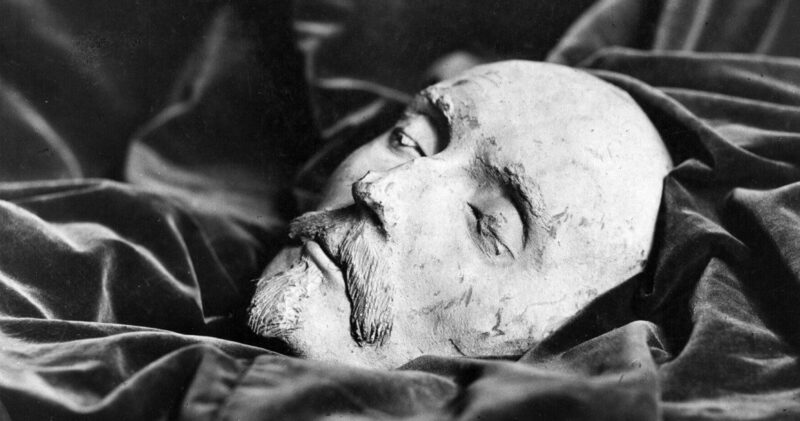 Found two centuries after his death, this is maybe the death mask of William Shakespeare. Of course, it’s just as likely it’s any other super dead person.